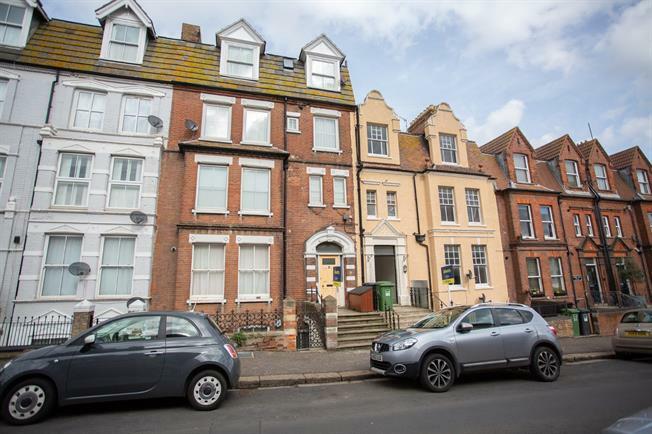 2 Bedroom Flat For Sale in Norfolk for Asking Price £145,000. An upper ground floor flat which comprises entrance hall, lounge, kitchen, two bedrooms and bathroom, the home backs onto Evington Lawns with the sea beyond so is ideally situated for the town and beach. The home has gas central heating and the vendor has informed us that the flat is leasehold with a share in the freehold. Mail box and door to the flat. Telephone entry system, radiator, exposed floor and under stairs cupboard. Rear aspect bay window with views over Evington Lawns and the sea in the distance, radiator, ceiling rose and television point. Fitted with a range of base and wall units with working surfaces over, tiled surrounds, inset stainless steel sink unit with drainer, electric cooker point with extractor fan, plumbing for washing machine and space for fridge. Two front aspect windows, radiator, ceiling rose, built in cupboard with gas fired boiler and shelving. Rear aspect window with views over Evington Lawns with the sea beyond and radiator. Suite comprising low level WC, wash hand basin, panel enclosed bath with separate shower over, tiled surrounds, extractor fan, exposed floor and radiator. The vendor informs us that they pay approximately £720 per annum for maintenance of the building including building insurance, the property is leasehold with a share in the freehold with the term to 2190, letting and holiday letting is not allowed.